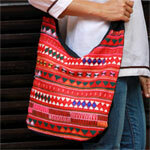 By the artisans of northern Thailand, this colorful shoulder bag is hand-crafted of cotton. 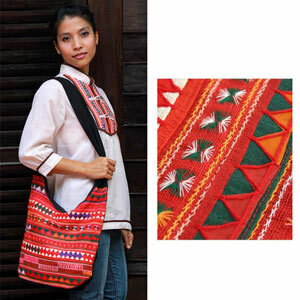 The artisans add an embroidery and appliqué decoration handmade by Thailand's Akha ethnic minority people. The bag is fully lined and features two inner pockets to keep small items handy. It closes with a zipper.